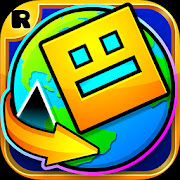 Geometry Dash is back with a brand new adventure! New levels, new music, new monsters, new everything! Flex your clicky finger as you jump, fly and flip your way through dark caves and spiky obstacles. Discover the lands, play online levels and find the secrets hidden within the World of Geometry Dash!